Smooth muscle cells of myometrium gives rise to benign tumors fibroids. 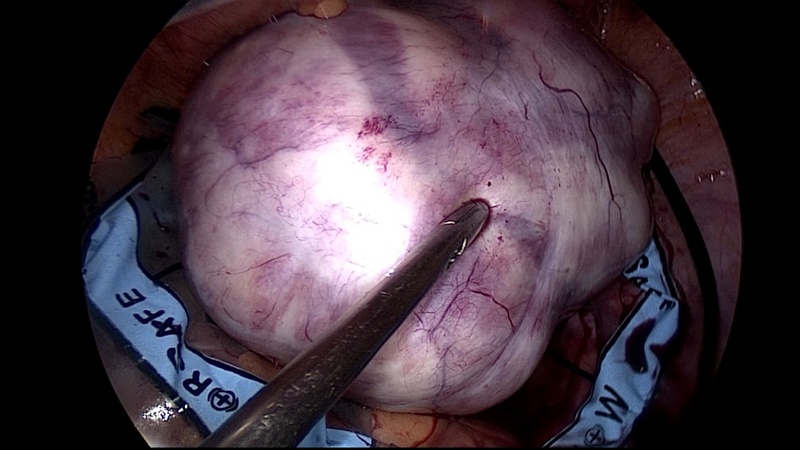 We report unusual case presentation of large pedunculated fibroid in unmarried young patient managed surgically by laproscopically with endobag morcellation to prevent parasitic fibroid and spread of occult malignancy. Uterine myoma appears in 20-50% of women of late reproductive age.Estrogen and progesterone are hormones incorporated in their proliferation. [2, 3] Depending on the locations, fibroids may be submucosal, intramural, subserosal or sometimes found in the broad ligament. Occasionally, subserosal leiomyomas may become pedunculated, which may cause torsion requiring urgent surgical intervention. 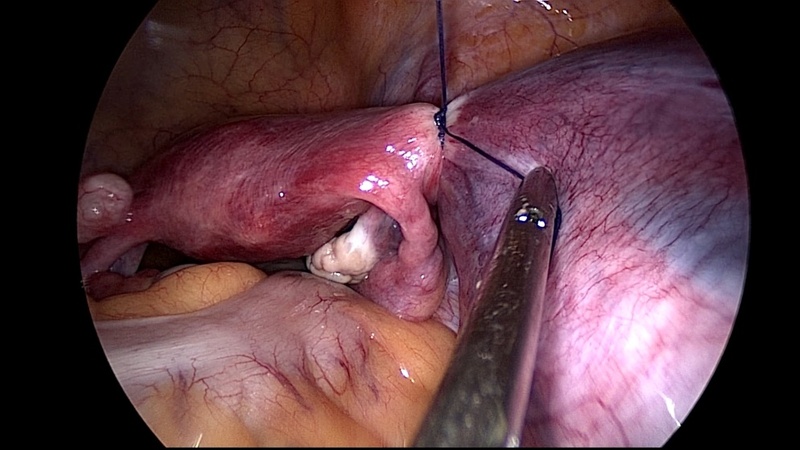 Best possible approach for young, unmarried patient presenting with large pedunculated fibroid would be laproscopy and endobag morcellation of fibroid to prevent occurrence of future parasitic fibroids due to seeding of remaining tissue fragments in the abdominal cavity. 33 years unmarried female presented to gynaecology OPD with complaints of pain in abdomen and distension of abdomen over few months. General examination was normal. On abdominal examination, 18 weeks mass was palpable which was mobile. Ultrasound was suggestive of large 11x12cm lateral wall fibroid, with possibility of broad ligament fibroid. MRI was suggestive of pedunculated fibroid with no evidence of hydroureter. All preoperative evaluation was done and found to be normal. 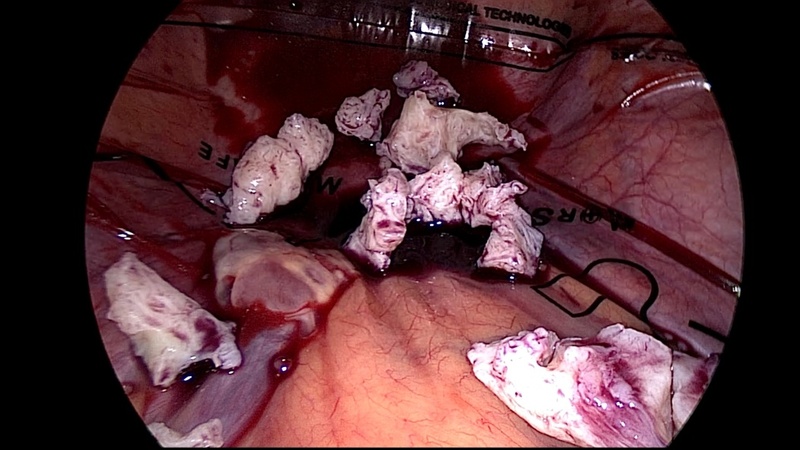 During laparoscopy, diagnosis of pedunculated fibroid was confirmed (figure 1). Base of the fibroid was tied with Vicryl no 1 and fibroid was excised with help of bipolar and scissors (figure 2). Fibroid was put in endobag and in bag morcellation was done (figures 3,4,5). 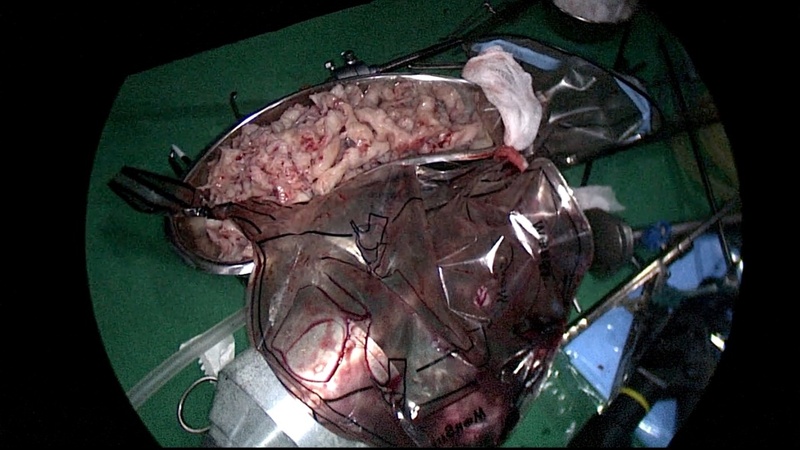 Specimen was removed and interceed was placed (figure 6) to prevent future adhesions. No evidence of active bleeding intra-op. Postoperative period was uneventful and patient was discharged on third postoperative day. Figure 1. 12 cm fibroid. Figure 2. Pedunculated fibroid, base tied. Figure 4. In bag morcellation. 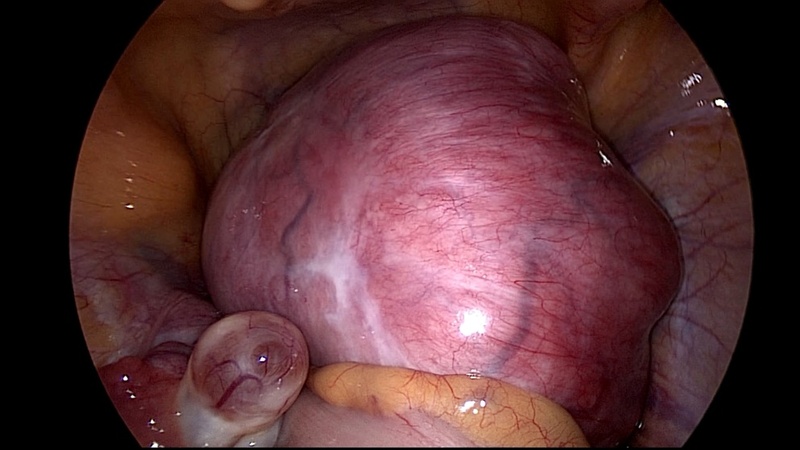 Leiomyoma uterus is the most common benign neoplasm of the uterus found in reproductive women. Their number, location and size determine the clinical behaviour and almost 50% have no symptoms. The diagnosis is commonly an incidental finding on ultrasound. Management of fibroids should be patient-specific. In the case described here, presentation was a progressively enlarging abdominal mass that appeared to be benign. Ultrasonography is the primary modality for diagnosing a suspected uterine fibroid. For treatment in young patients, myomectomy is preferred for large symptomatic fibroids and may be performed by laparotomy or laparoscopy. For young women, laparoscopic myomectomy gives high rate of patient satisfaction. Uterine artery embolization is treatment option for symptomatic fibroids with low long-term morbidity as an alternative to myomectomy and hysterectomy, but usually not preferred in young women yet to complete their family. MR-guided focused ultrasound has been claimed to be a safe and effective treatment for pedunculated subserosal fibroids, but suitability needs to be confirmed by large prospective studies. 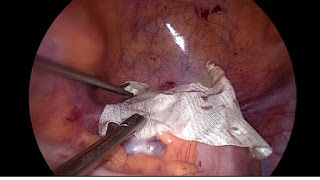 In laparoscopy cases, Tissue retrieval is a unique challenge since long time. With power morcellation, there is a risk that the procedure will spread the cancerous tissue within the abdomen and pelvis, if performed in women with unsuspected uterine sarcoma. Evaluation by sonography, Doppler or markers is also not completely reliable to diagnose a case of sarcoma. The US FDA discourages the use of laparoscopic power morcellation during hysterectomy or myomectomy. Endobag morcellation has been used and has been shown to be safe. Therefore to prevent both parasitic fibroid occurrence and spread of occult malignancy endobag morcellation should be used routinely. Interceed is the most widely used adhesion prevention agent. It transforms into a gelatinous mass, covering the damaged peritoneal surfaces and forming a barrier, physically separating the adjacent raw peritoneal surfaces. Benefits of laproscopic minimal access surgery with quick recovery should be considered in young patients after proper counselling along with endobag retrieval of specimen for better future outcome. Stovall TG. Myomectomy. In: Mann WJ, Stovall TG, editors. Gynaecologic Surgery. New York: Churchill Livingstone. 1996; pp. 445-61. Andersen J. Growth factors and cytokines in uterine leiomyomas. Semin Reprod Endocrinol. 1996;14(3):269–282. Berek JS. Benign Disease of the Female Reproductive Tract. In: Berek JS, editor. Novak’s Gynecology. 13th ed. Philadelphia: Lippincott Williams & Wilkins 2002; pp. 380-7. Gupta S, Jose J, Manyonda I. Clinical presentation of fibroids. Best Pract Res Clin Obstet Gynaecol 2008; 22(4):615-26. Marret H, Fritel X, Ouldamer L, Bendifallah S, Brun JL, De Jesus I. Therapeutic management of uterine fibroid tumors: updated French guidelines. Eur J Obstet Gynecol Reprod Biol 2012; 165(2):156-64. Park H, Yoon SW, Kim KA, Jung Kim D, Jung SG. Magnetic resonance imaging–guided focused ultrasound treatment of pedunculated subserosal uterine fibroids: a preliminary report. J Vasc Interv Radiol. 2012; 23(12):1589-93. 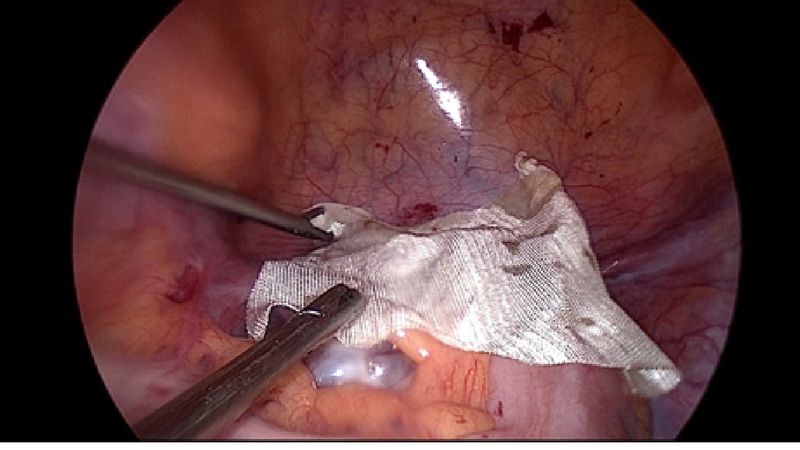 Angioni S, Pontis A, Multinu A, Melis G. Safe endobag morcellation in a single-port laparoscopy subtotal hysterectomy. Minim Invasive Ther Allied Technol. 2016; 25(2):113-6.